The Aesthetic Technologies Lab offers an interdisciplinary / transdisciplinary certificate program that enables students to be fluent in critical theory, creative practice and practical applications in the digital domain and across shared communicative networks. This program features a student-centered approach to competency development and demonstration, and provides a unique set of experiences and encounters. • existing courses offered both in the College of Fine Arts and across the university. The domain sub-topics create a matrix of experiences and skills that are fundamental to understanding and working across the digital domain, yet are open enough to allow for a tremendous range of customization by the student in order to keep the program relevant to the learner’s needs as well as essential to the rigors of the subject domain. A capstone document will be the final requirement for the completion of each domain, and will require the learner to demonstrate their ability to reflect, assess, track, and extend (RATE) the learning encountered in the completion of the programmatic domain. These capstones will be instrumental in assessing the operational and practical elements of the program from an administrative standpoint. Additionally, THE MASTER LECTURE SERIES creates a 4th domain and core curricular experience for all Certificate Program participants. These lectures will be delivered via Skype or comparable mediated systems, and be held in theater/lecture hall settings on specific dates. Advanced reading materials, discussion boards and archival podcasts of each of these talks will also be available for students unable to attend. There will be a requirement of real-time participation in at least 5 of the lectures in order to enable cross-talk between students over a common nexus of materials and experiences. It is anticipated that these core curricular sessions will help to create a cohort of learners who will encounter one another as they make their way through their individual programs. Nested within each domain are at least 2-courses that are core elements of the domain. 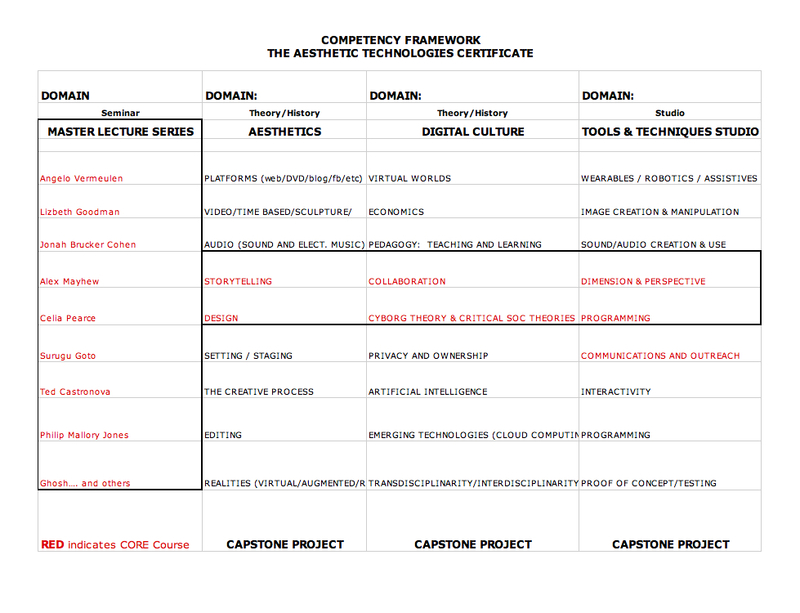 These are core concept classes that will require participation by each and every certificate student. It is anticipated that these core concept courses, coupled with the required participation in the lecture series will enhance the familiarity of students with one another as well as with the program, and build a distinct and cooperative certificate program community. • Personal digital tools as integral components to collecting data, creating work, and demonstrating competency. Interdisicplinarity… in working modes, tool sets, philosophical approaches, and project development from the understanding that each core discipline has elements to share with others. Abstraction/Multiple-Modalities… in conceptual design of courses, course delivery models, and especially in assessment rubrics offered to students. There are many avenues that lead a student to their understanding of a concept. What we want them to do is to take basic concepts and demonstrate the ways that they relate to their particular areas of focus, interest, or work. Process-centered approaches to working methods… A process centered approach to course work, students will demonstrate a trajectory of research and discovery through providing a portfolio or documentation that punctuates their growth and understanding of a subject, content area, or competency. Student-centric learning and pedagogical constructivism… making a learning environment personalized, flexible and relevant will help to keep a student motivated as they will always be at the center of their learning program, and the learning program will suit their needs rather than forcing the student to fit “x” requirement into their program. Critical discourse and Critical Response…in philosophical and theoretical terms as well as in practical and peer response. It is imperative for today’s learner to be well-versed in not only the histories of their practice, but in relevant social theories that ground global movements. Articulating these influences whether direct, inferred, indirect or other will allow our students to demonstrate their understanding of the direct relationship between their ideas and the ways in which they are supported or in conflict with prevailing trends, pervasive cultural convention, or historical lineage. Each satisfaction of a competency area will be able to site a triangulation of methods under-girding its completion. In requiring our students to push beyond the “term paper” approach or even the artwork/archive approach to the demonstration of a competency we ask that the student not only reflect and articulate their steps towards topic understanding, but how their understanding is inter-related across a broader spectrum of relationships, disciplines, work ways / methodologies and domains. What makes our students stand apart is that they recognize that their experiences offline and online are of profound importance, and that their participation during this foundational era of new creative practices, online pedagogy, and digital theory, can provide the insights that will be quoted into the ages. This curriculum is being developed as a foundational bootcamp for the new philosophers, theoreticians, and creative practitioners who will lead in this era of the hybrid scholar. We don’t simply seek literacy. Literacy is not enough. We seek those interested in joining the shift to a hybrid educational and creative approach, practice, philosophy and trajectory – those who will add to the narrative of new learning practice and theory. This program will require 40% of all offerings to occur in the “metaverse” or through mediated learning devices and environments. This balance between the proximal and the distributed will offer our learners practical experience as they transition between these domains for their creative works and philosophical considerations, and prepare them to use this operational understanding as leaders in arts, education and industry. What sets this program apart from most Ohio University based programs is its unique and flexible competency assessment rubric. This is not a program that is simply satisfied through traditional coursework, though it does also offer the ability to follow a traditional track towards the satisfaction of competency. The program is personalized and developed by each student, offering an opportunity for students to create a learning program that best suits their academic or professional goals. DePaul University’s School for New Learning: a competency based, highly customizable program targeted towards re-entry students, the business community (lifelong learning) leading to a variety of BA degrees. 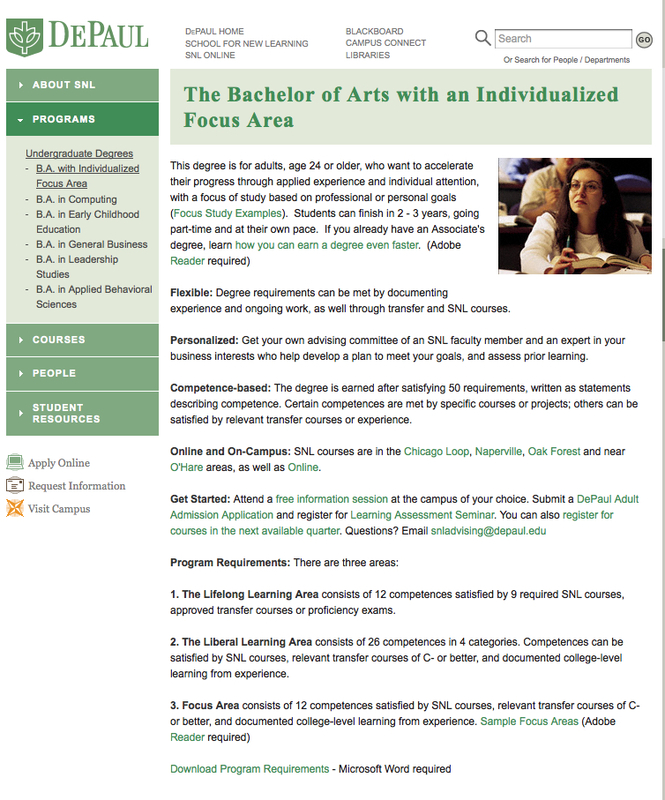 The DePaul SNL site includes details on the program structure, competency grid, and requirements. Arizona State University’s AME (Arts, Media, Engineering) Program: an interdisciplinary program rooted in arts practice, but integrated across a broad range of disciplines. The National Science Foundation’s IGERT Program has enabled important research and programmatic growth in the area of interdiciplinary practices. This program supports innovative ideas to stimulate new thinking in the sciences and across education. The missing component in much of what we see in Science education is the marriage of the sciences with the creative experimentation and artistic process. We have an opportunity and responsibility to bridge the gap between what is thought of as unrelated practices. The kinetic sculptor and engineer Theo Jansen once said “the walls between art and engineering exist only in our minds.” We can deliver a new program that emerges with this statement as a core belief, and situates our college as the hub of innovation. Ohio University’s certificate programs in: Womens Studies, and Politics and Communication for providing the foundational conventions of approved, successful and operational certificate programs currently within the OU system. Katherine Milton wishes to acknowledge the following individuals for their advice and engagement in the development of this approach: Philip Mallory Jones, Nathaniel Berger, John Sabraw, Ghosh, Muriel Ballou, Alexandra Hibbet, Judith Grant, Christopher Keesey, Hans Kruse and Theresa Franklin.